I was just lurking through the threads and realized there wasn't a Kpop thread. So I thought of starting one. I'm not active nor knowledgeable about Kpop at all. I'm into 1 group only so I'm not a good source of any info or anything like that. But that group's music did help me a lot when I was super into them so I wanted to learn more about my co-Deppy fans (phans?) who are also into Kpop on what their opinions are on the different girl groups and boy groups, their music, MVs, dance routines, fans' recommendations, the Kpop culture in general, etc. I love hearing analysis from people, so I thought why not start the thread? You can also say how and why you got into Kpop or the groups you're into. So I'll start. I was actually a Bigbang . My bias is Seungri because I like his personality. He's very vibrant and positive despite all the negative criticisms about him. I feel like he works hard at keeping the fans feel more connected to the group, and he adds a human touch to an otherwise intimidating group. I can go on and on about why I love him so I'll stop here. I was a casual fan until the MADE series, when my sister, who was a bigger fan, convinced our parents to buy us tickets, so we were able to go to their concert in my country. The concert was awesome and I was at the edge of my seat the entire time screaming my heart out. It also felt nice to be in a community that, despite the language barrier, felt united by a common love for these foreigners and their music. Everyone started singing Haru Haru and even if I knew I mispronounced a lot of the words (and even made up some of my own like Phil. xD), it was indescribable in the best way possible. Bigbang's music is literally what I only listen to when I study because I find it hard to concentrate when I understand the words of the music I listen to, so it's been my crutch whenever I have to study with people around me. But the translations of their songs (especially Blue) are so beautiful. GD is such a gifted songwriter. Even his play on words are incredible. I'm a casual kpop fan, there are only two groups that truly interest me; After School and Seventeen. Basically everything else is just me checking out new releases that might interest me, and 95% of those are girl groups. Like Wonder Girls - Why So Lonely and SISTAR - I Like That were my songs of the summer I listened to them so much. After School is my ultimate bias group and nothing can ever take their place no matter what. Pledis, their company, has been ignoring their existence for the past 3 years and there are still no plans for a comeback. Some individual members are successful but the group... I'm waiting for a disbandment without a proper goodbye basically, and since Pledis is getting ready to debut their new girl group (who sadly don't interest me despite their talent) I expect one soon enough. That or they're just waiting for all the members' contracts to run out, a member actually recently confessed that as the end date of her contract approaches the company is giving her less work. ANYWAY, despite Pledis killing another one of their acts After School is still worth getting into. Aside from their amazing discography, AFSC are known for their admission/graduation system which is unique in Kpop (and hated by many but I personally like my idols being happy and not being forced to stay in the group weird right?) and their special performance concepts. The groups founder and original leader is Park Kahi, an amazing and well known dancer in the Korean industry, so there's always an emphasis on difficult and sharp choreo anyway. Their special performances bring that to a whole new level though. Bang! had a marching band concept with an actual drum line performance as intro, Shampoo had a tap dance performance as intro and they learned pole dancing for First Love. True legends. They're also one of the best looking girl groups out there, the original model group. Song recommendations: Bang!, Flashback, First Love, Because Of You and Shampoo and be sure to listen to their Japanese material as well like Dilly Dally, Gimme Love, Rambling Girls, Heaven and Shh. Honestly there are very little songs from them that I dislike. Nana is my bias btw, no surprise there considering my icon and sig. After School has a cute/weird candy culture subunit named Orange Caramel who scored a pretty big hit with their song Catallena, the origin of my username on IDB. D&P reacted to it one a YTR episode once. My second fav group and only boy group I stan is Seventeen. I hate that I stan another group from Pledis after what they did to my true faves, but Seventeen is special and I've kept my eye on them since their pre-debut days. They stole my heart officially at debut and pretty much everything they've done after that has impressed me. Unlike the same suggests Seventeen actually consists of the 13 members, divided over 3 units (hiphop, vocal, performance). 13 members + 3 units + 1 team =17 < I hope whoever came up with that got a raise. They're all super talented cuties and they write, produce and choreograph all their own stuff. Many members write lyrics, but the true musical mastermind is Woozi and Hoshi is choreography genius. They get some help of course, but it's amazing to see what these kids can already do and they'll only get better. Aside from that they're highly amusing to watch because they're like 13 hyper puppies. Song recs: Adore U, Mansae, Pretty U, Very Nice, Shining Diamond, 20, Fronting, Rock, No F.U.N. and Q&A a collab of Woozi, Seungcheol and Vernon with soloist Ailee. My biases are Seungcheol, Joshua and Vernon (nope not choosing). Thanks for the reply Catallena. I'll be sure to check out After School and Seventeen! Thanks for talking about them! I've heard of After School before already but only because of UEE x Seungri and UEE x Daesung interactions in variety shows so I haven't listened to their music yet, so I'm excited to check that out. I've been trying to expand my Kpop horizons beyond Bigbang (and YG) so this helps a lot. I do know of Seventeen cause of MAMA 2015. Their collab stage with Monsta X was very explosive yet entertaining. I liked the 2 group's energy. The walking on the desk part was my fave. Very suave execution. Aurgh. I hate it when the older groups are being ignored in favor of new ones. :sideeye: I hope once their contract ends they can go to a company that will utilize their talents. I just realized I didn't do a rec of Bigbang songs and MVs in case anyone's interested. Whatever genre of music you'd want, whatever type of MV you need, usually Bigbang's already done it. (They are one of the oldest active groups, they just celebrated their 10th anniversary). So I subcategorized my recommendations into the different genres or whether you want to feel a certain emotion. So here's one under the cut. (Those 2 videos above are my favorites that's why they're the ones I linked). Firstly, could you all please always put videos under spoilers, because if there are going to be a lot of videos on the page that preload, it’s going to take a while to load the page. Secondly, oh wow, I have so much to talk about and I have no friends that like Kpop as much as I do. I consider myself a „casual“ fan of Kpop because I don’t have a favourite group per se and I don’t really think that „MY BIAS IS BETTER THAN YOURS!1!1one1“ but I do keep up with Kpop and I also have biases in groups usually. There are a very few select groups that I dislike for various reasons (like sound – Secret) but I also tend not to like the „aegyo“ type of groups because I used to be a huge fan of Jpop (still am a fan of Jrock/metal and generally am a Kpop loving metalhead) and I think my phrase with overly cutesy stuff is over. That being said I do like groups more which have darker and edgier elements in them. Stellar (very underrated, their music is very solid), T-ARA (I love Hyomin and JiYeon), Miss A (sadly Jia left, argh), Wonder Girls, KARA (didn’t disband, ditched their label tho), F(x) (I loved the whole 4 walls album). There are a lot that I have probably left out. I have been a stable Kpop fan since 2010, when Brown Eyed Girls singer Narsha released THIS SONG, but even before that, artists like BOA, Younha and TVXQ were known in the anime circles. I think Miss A's debut, T-ara- Bo Beep, Shinee - RingDingDong, BEG- Abracadabra and Super Junior- Sorry Sorry really made their mark on me (and let's not forget 2ne1 but I really didn't like their debut). I also enjoy 2 react channels: MRJKPOP and JREKML, first being more analytical about the music and the second being more entertaining. I get my new chart-info mostly from K-Ville ent. Because I’m too lazy to use Kpop amino or follow any website. So I like some songs from artists that I don’t follow that much. Disclaimer: I'm sorry if I wrote a name wrong or dared to miss a capitalized letter, some people are just really weird. RiriPandaHeart2 wrote: Thanks for the reply Catallena. I'll be sure to check out After School and Seventeen! Thanks for talking about them! No problem, always here to hype up my faves. Yes UEE is the most well known member (though Nana has risen more in the last few years I guess) so it doesn't surprise me that you know her. Since all the original members have graduated she's now the oldest member in After School, but she has been focused on acting for the past years and is openly dating so I feel like idol life is behind her (though I obviously hope it isn't). I feel like we're gonna see a lot more older groups disband in the next two years. As far as After School's fellow girl groups go, 4Minute already went and KARA's situation is... confusing. I don't see 2NE1, Rainbow, Secret or Stellar lasting long, their contracts might be coming to an end soon as well. Dunno about boy groups. Anonymousse wrote: Firstly, could you all please always put videos under spoilers, because if there are going to be a lot of videos on the page that preload, it’s going to take a while to load the page. I'm happy to see NU'EST appreciation, they're another Pledis artist like AFSC and SVT so I have a soft spot for them even though I don't stan. Love Paint and Overcome (their comeback earlier this year) were so good but I fear disbandment for them soon too. Their sales are bad and only seem to get worse. It's such a shame, the group isn't even that old yet (2012 debutee) and they're all young (a 93 liner and four 95 liners) but due to mismanagement they never had a chance. Nothing much to add, just enjoying the posts and recs. I don't really listen to KPop and the only 'band' that I really listen to is LeeSsang and I don't think that counted. Back in secondary school, I have a friend who loves SuJu and long story short I can recognise Sorry Sorry from it's first few bars. But the thing is, I just wanna share this where BoA is featured in Westlife (my most fav boyband in the world handdown if you have no idea who they are) for their iconic song for Asian release of an album. It wasn't really that good because I don't think their voice match but I just wanna share this. swofro wrote: Nothing much to add, just enjoying the posts and recs. I don't really listen to KPop and the only 'band' that I really listen to is LeeSsang and I don't think that counted. Back in secondary school, I have a friend who loves SuJu and long story short I can recognise Sorry Sorry from it's first few bars. This song was on the soundtrack and in the credits of the Pokémon 2000 The Power Of One movie, the version without BoA anyway. But it amused me years later when I found the version with her in it. I always find it shocking how young she was when she debuted though. Scouted at 11, debuted at 13... Never had normal teenage life, forced out of school to train and work. Many trainees and idols are really far too young. Anon, this looks like an attempt to moderate. You can ask people to try and use spoiler tags, but please don't tell people how to post. Wow, I have actually stumbled across the K-pop thread, apparently my lurking skills are quite rusty. Let's see, my current faves are Mamamoo, EXO, Red Velvet, Twice, IOI, Seventeen, BlackPink and f(x). I definitely recommend heaps of their songs, which I will attempt to list here.. There is a handy guide in our FAQ. I knew I was doing something wrong! Thank you! Kpop is currently very boring for me. Mentioned and linked earlier in the thread by basictrashfan (Welcome!) but Twice disappointing me with TT... Like Cheer Up wasn't good either but it was annoyingly catchy enough (the shashasha thing) that it would get stuck in your head all the time so you'd like it eventually. But TT is missing something, there's nothing about the song that really draws me in. The MV is really cute though, aside from the awful CGI they used for the mermaid. I'm not here for BLACKPINK's Playing With Fire and Stay either. I loved Boombayah and Whistle as (late) summer bops, but these don't really do anything for me. They don't really seem title track material, more like average full length album tracks. Both MV's are beautiful and the girls are gorgeous but musically they haven't won me over yet. Seventeen's Hip Hop Unit dropped their mix tape thingy Check In today. Despite two out of my three biases being HHU members I don't reall care for the genre so it didn't interest me. I am mad at the stylists for doing that to Mingyu's hair though, poor thing looks like he got dipped in Cheetos dust. Who the hell approved that? Also Rainbow is disbanding, the 2009 line of girl groups really is dying out slowly... :sobs: I expect Pledis to hit me with After School's disbandment next year when they debut their new girl group. Or maybe earlier, Nana and Raina's contracts expire in December apparently and if they don't renew then they should just end it because they obviously have no reason (or trainees considering everyone is in Pledis Girlz now) to continue the graduation/admission system. I hate stanning dead groups owned by incompetent agencies. Catallena wrote: Also Rainbow is disbanding, the 2009 line of girl groups really is dying out slowly... :sobs: I expect Pledis to hit me with After School's disbandment next year when they debut their new girl group. Or maybe earlier, Nana and Raina's contracts expire in December apparently and if they don't renew then they should just end it because they obviously have no reason (or trainees considering everyone is in Pledis Girlz now) to continue the graduation/admission system. I hate stanning dead groups owned by incompetent agencies. I feel really bad for rainbow. 7 years of hard work not including their trainee days and they never managed to get as popular as some of the groups that debuted after them. They had some catchy songs like A but sadly they never caught the public's attention. I can see Nana pursuing acting more if she doesn't renew her contract. I didn't watch The Good Wife but I saw a lot of positive feedback about her acting in it. It's sadly inevitable with how many groups come onto the scene every year, those who don't disband within a year just hang in there but never quite make it. Rainbow, Secret, Stellar, Fiestar, SPICA etc. are all great girl groups but if they haven't found true success now they never will... It's cruel, especially considering idols don't really get to have a normal teenage life or even childhood due to training and sometimes really early debut ages. I can actually see Nana renewing her contract, it's Raina I'm not sure about. She isn't an actress, she doesn't have Nana's visuals or Lizzy's variety skills. She doesn't have a back up plan like that, she's just a really good singer. Pledis doesn't seem to care for her all that much so I can see her moving to Brand New Music, even though that is a hip hop label. After the success of Midsummer Night Sweetness which she featured on, she's with them more than she's with Pledis. I was never a huge fan of Rainbow tho they did seem to have some fairly popular songs "back in the day". It's scary to think about how easily groups get dropped from labels because of them "not doing so well". Personally I have been fearing for (as Catallena mentioned) Stellar, even though they seem to be doing better that pre-Marionette days and have a less infamous reputation than they had during that era, they could also be dropped for not selling enough. I remember EXID being threatened with being disbanded because they weren't selling enough but then Up&Down happened and they got their well-deserved fame (Can't get over Solji crying). I think about 4Minute being disbanded fairly often because I do wonder how uncomfortable it possibly was for Hyuna. A lot of people like to paint her as the bully or the one who got all the fame (like it is a negative thing) but I do wonder if it was her bidding or most likely their label pushing her forward from the other members because of profit. That probably caused a lot of "fun" friction and tension between the members. If you know my life a bit more (and some people here do) you'd know how many issues I have due to it in my personal life. I'm starting to dig 2PM. No, not "again", I never liked them back in the day because they were just another boy group to me. Now they seem to have matured and Promise(I'll be) is such a beautiful song and video. It's very pleasing for both the eye and ear. This deserves so many more views, argh. Double post but hey it's been a while and there's important news soooo. Another 2009 girl group bites the dust.. 2016 already took 4Minute and Rainbow, now YG has officially announced 2NE1's disbandment. Park Bom didn't renew her contract and that was the end (which apparently already happened in May according to them, they're just announcing it now??). I'm not at all shocked because they've been inactive for so long now and after Minzy's departure, CL continuing her search for (overseas) solo success + YG now having a new girl group it was bound to happen soon enough. I'm still sad though, I wasn't much of a 2NE1 fan but they were iconic in their prime. After School - Inactive in Korea since 2013, since 2015 no Japanese activities anymore either. Possibility of comeback is almost none, Uee and Nana continue to earn half of the money Pledis spends on their boy groups. f(x) - Sulli left last year, haven't done much as a group since '4 Walls' last year. I think they released something in Japan recently but no Korean comeback. Secret - Never really hit it big to begin with, last comeback was in 2014 and member Sunhwa left in September. There are rumors members don't get along. T-ara - Going strong despite fake bullying scandal, Korean general public still hates them but they're making bank in China. Two members left but they were late additions so they're currently still in their debut line-up. 2ne1 disbandment - tbh I was expecting this to happen. CL didn't seem very interested to continue as a group because she seems to want to hit in big in the states and I totally get her. Maybe she is slightly looking up to Jay Park in that matter because he makes both Korean and English music but doesn't have the pressure of being in a group (since he got kicked out of 2PM years ago). This was kind of expected. The other thing in the news today (YG has had quite a day today) is that Taehyun has now left Winner due to mental issues. Now I wish the best for him and the group but oh boy is Twitter in a frenzy today. They are blaming YG for kicking artist out of groups because of mental health reasons (like Park Bom). Rumors, don't you just love the rumors? In regards of who will disband next - Still scared for Stellar tbh, I love them but their comeback with "Crying" was weak. f(x) - they did release "All Mine" a few months ago - the song was fairly weak but it seemed to do pretty okay on the charts for a weak song. Luna and Amber are doing some stuff on the side and Victoria is doing some acting stuff in China but they seem to work a lot better and stronger since Sulli left (nothing against Sulli, I really liked her). T-ara - they came out with a song "Tiamo" 2 weeks ago. Weak song but they are still active and I think that a lot of their fans have forgiven them for the "bullying drama" a few years ago. Miss A - Since it has been mostly about Suzy and they haven't made anything in a while and Jia left (also the bunch of controversies with Fei).... Their disbandments seems an actual probability. Speaking of disbandments - I wonder when Kara will do comeback and under what label since they did not disband but they just dropped their label (and good for them, they were really overworked). Anonymousse wrote: 2ne1 disbandment - tbh I was expecting this to happen. CL didn't seem very interested to continue as a group because she seems to want to hit in big in the states and I totally get her. Maybe she is slightly looking up to Jay Park in that matter because he makes both Korean and English music but doesn't have the pressure of being in a group (since he got kicked out of 2PM years ago). I find YG shady as hell, and so are both situations with 2NE1 and WINNER. Bom and Minzy apparently both didn't renew contracts earlier this year, yet only Minzy's departure was announced and they said 2NE1 would continue on as 3 when they knew that wasn't true. YG wanted to debut his 'prettier' new 2NE1 (his words not mine) in the form of BLACKPINK soon and they knew damn well 2NE1 would disband, instead they kinda let the responsibility of another year without comeback land on Minzy's shoulders. Stellar and Miss A are also contenders for my Battle Royale poule of girl groups, I can't see either of them lasting very long. Yeah I knew about f(x)'s All Mine, but didn't count it because it was an SM Station release. I hope they get a proper comeback soon, 4 Walls was good. I'm kinda wondering how a KARA revival would go. Can they still use the name? Their old songs? I hope they succeed in bringing the group back. I have been hearing so many different rumors that my head is about to explode. Now there is a #JusticeFor2NE1 hashtag on twitter. Have any of the members said anything officially or still just only speculation? I'm too busy for the next few days to try to scout for truth and twitter is not helping. Here to hype up SEVENTEEN, because my fave boys are making their 3rd comeback this year with BOOM BOOM. The song took a few listens to grow on me but I really like it now even if it's not my favorite title song to date (mostly because of the chorus). Seems like they're slowly leaving the innocent flower boy image but not in an extreme way yet, which is good because they still have underage members and I already think the amount of hip thrusting in their choreo is a bit much. /mom Can't wait to see them performing this live! CL, Dara and Bom have all made generic statements on social media, apologizing to fans and about how much they love the other members. Dara unfollowed YG on Instagram. CL said they were working on an album during the summer but that 'it didn't work out' which is weird because YG said the contracts had already expired before summer in May 2016..
And I thought 4M's disbandment was messy. How wrong I was.. 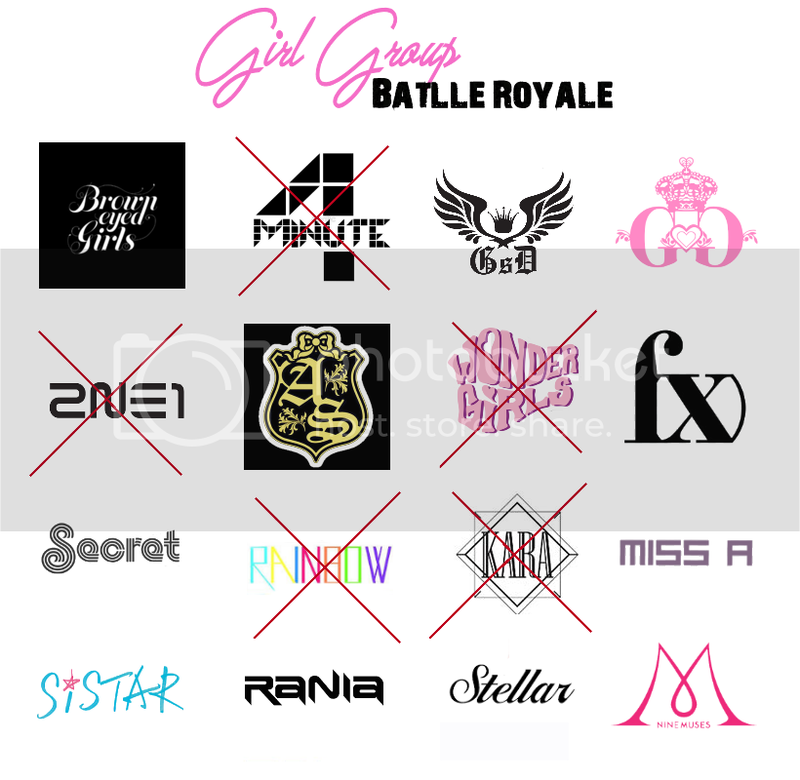 Reviving this thread to bring the news of another legendary classic girl group disbanding and continue Girl Group Battle Royale. RIP Wonder Girls, the queens of bops, failed american debuts (thanks for nothing JYP) and reinventing themselves into a proper retro band. Sunmi and Yeeun will be leaving. leaving JYP, Hyerim and Yubin are staying. We're getting one last goodbye single from them on the 10th of February, the month that marks 10 years since their debut. I really hope they all remain friends, past members Sunye, Sohee and Hyuna included. At least their last comeback was a hit, they really deserved that after everything they went through. Anyway my Girl Group Battle Royale continues and yes I actually made this mess of graphic (for myself, but here it is anyway). Who's next? - These are all groups I'm at least a little worried for because of contract expiration, messy management, age (as group or individual members), member departures, inactivity, rumors of members not being able to stand each other, or just bad sales. - All these groups are from the 2006-2011 golden era of kpop. - I kinda forgot some groups though (oops); Davichi, T-ara, Brave Girls and Sunny Hill. I don't actually know anything about Davichi. I know they're a female duo and that's how far my knowledge goes, but I don't think they're really in the idol sphere anymore (though I guess B.E.G. isn't either). T-ara already said they aren't disbanding, and despite being hated by the Korean general public they're super popular in China. Brave Girls lost their last two original members this month, but I think they'll continue on struggling with or without new additions. I'm unsure about the status of Sunny Hill. - Not included here but I would like to note that there are plenty of groups of later debut date like Spica, Hello Venus, Tahiti and Fiestar who also struggle.. No surprise considering how many groups are debuting every year. What we learned from this is that I have a weird fascination with disbanding and struggling groups. To end my girl group appreciation post, here's two recent releases from girl groups that I liked me; Hello Venus' new single Mysterious and newly debuted group Dreamcatcher's Chase Me (it's a little GFriend meets Babymetal, their choreography is amazing and I love everything about it). And not a girl group, but new co-ed group K.A.R.D. is life. I feel like S.M. would be hesitant to officially disband f(x) though, if they even got The Grace on indefinite hiatus since 2010 then there's no reason to disband them and add to the growing list of dead girl groups (RIP Spica) as long as the members remain in the company. And they renewed their individual contracts last year apparently, so I think f(x) is gonna continue existing for a while... I don't know how active they'll be though. Krystal is super popular without the group and Victoria makes bank in China, so squeezing in f(x) activities between all of that might be more trouble than it's worth. One comeback this year would be nice though.. it's been a while since 4 Walls. At this rate we won't have a 2009 girl group left by the end of the year, except for T-ara who are gonna continue on and on if only to anger netizens and remind the public that their domestic careers were ruined by a fake bullying scandal that has now been proven. Catallena wrote: At this rate we won't have a 2009 girl group left by the end of the year, except for T-ara who are gonna continue on and on if only to anger netizens and remind the public that their domestic careers were ruined by a fake bullying scandal that has now been proven. lmao nevermind, T-ara might be disbanding soon too though MBK Ent. has changed it's story about 3 times now. First they said the group would be done after their planned comeback in May, but now the story is that they're discussing contracts and that not all members have the same contract length so some members are expected to leave, but they're not disbanding. Sounds very much like an indefinite hiatus to me. Either way, I'm glad Hwayoung got exposed as a lying snake before T-ara went out and I hope they do well in May even if they'll never get full redemption for all the lost years due to the scandal.